thit paa-ee I have found thit - stability. aanad bha-i-aa and now I have found bliss. aanad means that type of bliss that is not taken away by any type of happiness or sadness. gur keenay Dharmaa The Guru through their glorious Grace, Dharmaa in this case means through their Grace and through their Dharmaa, this is the path of the Guru of uplifting us, the Guru has uplifted me through His Grace. gur pooraa aaraaDhi-aa binsee mayree peer. gur pooraa aaraaDhi-aa By meditating upon the pooraa, the perfect Guru, binsee mayree peer, peer my pains have binsee, are removed; the pains of birth and death, the pains of ego, desires and greed. tan man sabh seetal bha-i-aa, tan my body and my man - my mind; my physical and spiritual body, sabh, everything within me, seetal bha-i-aa has become very cold. paa-i-aa sukh beer O my beer my brother I have found sukh, true happiness, never ending, eternal joy. Another meaning of this line is, beer means a warrior. Those spiritual warriors who have meditated upon the Guru's mantar, Waheguru mantar, their mind and body has become seetal, their mind has become cold and soothed and they have found true happiness. rahao - Pause and think about this today, Guru Ji says. sovat har jap jaagi-aa paykhi-aa bismaad. 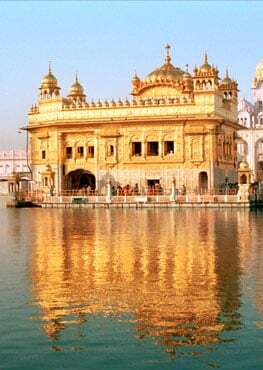 sovat har jap jaagi-aa, sovat The Guru's sikhs, when they go to sleep or are about to sleep, har jap they meditate upon Hari, Waheguru, upon the Lord God. jaagi-aa When they wake up they are singing God's praises. And another meaning: sovat I was asleep in maya, in the illusion, attachment of this world, har jap jaagi-aa and by meditating upon Waheguru, by meditating upon the jap, by meditation of Hari, of God, jaagi-aa I have been awoken from this sleep. I have realized the true meaning of life. paykhi-aa bismaad I have seen the Grace of God, bismaad is glorious, is enchanting. I am filled with wonder, peace and happiness. pee amrit tariptaasi-aa Drinking the amrit, the immortal nectar of God's name, tariptaasi-aa I am completely filled. taa kaa achraj su-aad I cannot describe su-aad taste of immortal nectar. It is achraj beyond words. aap mukat sangee taray kul kutamb uDhaaray. aap mukat sangee taray Those people who have meditated upon this name, who drink the immortal nectar of God's name and who meditate upon God when they sleep and when they get up, they are aap mukat, they are liberated. sangee taray Anyone who meets them, they are sangee, they taray, are liberated. kul kutamb uDhaaray They uDhaaray even liberate their kul all of their generations, their kutamb and all of their close family, all of them are uDhaaray, saved. By meeting with that person, by listening to Guru's vichaar, the Guru's mat, the Guru's wisdom, the Guru's understanding, those humble saints speak, the people who meet them are also saved. safal sayvaa gurdayv kee Service of my gurdayv, my divine Guru is safal is always fruitful, it blesses us. nirmal darbaaray What does the Guru seva do, what does the selfless service to the Guru do to us? When we go to the darbaaray court of the Guru we become nirmal purified. neech anaath ajaan mai nirgun gunheen. neech anaath ajaan mai I am neech lowly, I am anaath - I have no master to look after me, ajaan - I do not know I am ignorant of spiritual wisdom. nirgun gunheen, nirgun I have no virtues, gunheen in fact I am virtue less. Naanak ka-o kirpaa bha-ee But Satgur Ji says I have been blessed by Guru Sahib Ji's kirpaa, by Guru's grace. daas apnaa keen and I have been made his daas, his servant through His Grace.